Another day, another unreasonable miner. ...They didn't gank the miner. Agents Lewak and Minx Mattel killed a Caracal that was behaving suspiciously in an asteroid belt. It, too, lacked a permit. bloodmoney123's reaction outed the Caracal pilot as his alt. The Caracal was apparently posted there to guard bloodmoney123's Retriever. Needless to say, he failed. Without the watchful Caracal protecting him, bloodmoney123 was forced to dock up. The miner insisted that although he appeared to be a garden variety Retriever pilot, he was secretly an accomplished nullsec PvP'er. Well, maybe not so secretly anymore. Agent Damien Oxytocin conducted a follow-up interview with the miner while his fellow Agents looked for additional targets. Damien had trouble believing bloodymoney123's story. How could the miner be a skilled PvP'er if he wasn't even good at mining? ...He accused our Agents of cheating. 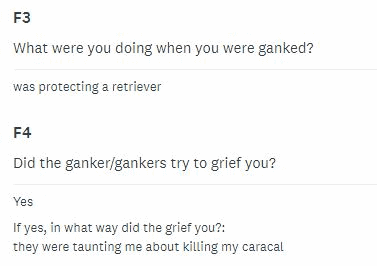 Even if bloodmoney123 wasn't truly a skilled PvP'er, he could still get his revenge by having all the gankers banned from EVE. A few days earlier, bloodmoney123 had been ganked by two other Agents, D34dly D34dly and Slutzilla. If they had been banned, it was news to them; they haven't stopped ganking since then. 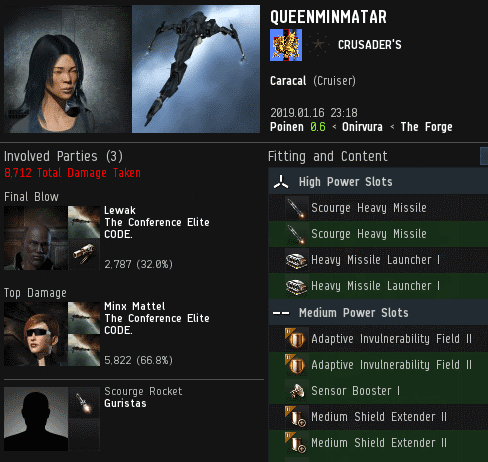 The miner finally revealed the identity of his main: A 14-year veteran of EVE and a member of TEST Alliance Please Ignore. Curious to learn more, our Agents sent the miner a link to a survey. Over the past few weeks, one of Minx Mattel's behind-the-scenes projects has been the gathering of data via a post-gank SurveyMonkey survey. To encourage gank recipients' honest cooperation, the survey is ostensibly being conducted by a concerned Anti-Ganking organization that intends to use the results to lobby CCP to end ganking. In reality, of course, Anti-Gankers don't do anything but fail, and the data is actually being collected by the New Order for its own enjoyment. bloodmonkey123 filled out his survey with candid responses. He confessed that he had been trying to use his Caracal to prevent the gank of his unlicensed Retriever. That's illegal mining and obstruction of justice. The survey shed some extra light on bloodmoney123's claim that our Agents were violating the EULA. This miner didn't learn much in the past 14 years. Gankers with -10 security status are always welcome in highsec. After all, it is their space to govern! "If they had been banned, it was news to them; they haven't stopped ganking since then." "was upset i logged off"
Please don't chuck a shardani. Highsec in a retriever. Does it not have any friends that can tell it how retarded it is in test? I have seen other imperium mining in highsec and shake my head as well. Looks like Kennyanon has evolved into Fuckanon. That's progress. For a brief second the Kenny-thing made him look like he had something to say, some agenda not immediately apparent. Too bad it turned out he was just parroting some insignificant internet personality. Now it's back to the mindless profanity miners are famous for! Go Fuckanon, show us how it's done! And we still have 3 more weeks in the competition!